It has been a little while since we covered Bang and Olufsen (B&O) products, and this Danish company puts out some quality electronic products with a very distinct and stylish look. One of their latest products from their television line is the BeoVision 8, a 32-inch flat screen with “an integrated center channel speaker that delivers state-of-the-art sound and picture quality”. The BeoVision 8 can be placed on the table, floor, TV stand, wall bracket, and it can be used as a TV or a computer monitor. The sound is a great quality with a down-facing bass speaker that provides terrific sound for great movies and music, and front units that are designed for the vocal aspect of your entertainment experience. Another bonus feature is the excellent picture quality. The BeoVision has a glare polarizer that provides the ideal contrast for whatever light is filling the room. In fact, the Beovision 8 has no glass in front of the screen, which can output more light than the BeoVision predecessors. This glare polarizer improves the contrast which allows for fuller colors and blacker blacks, along with some richer details. 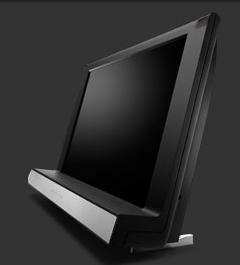 You can purchase the BeoVision 8 for about $3950.00 in Bang and Olufsen showrooms.